Tuesday 19th June. 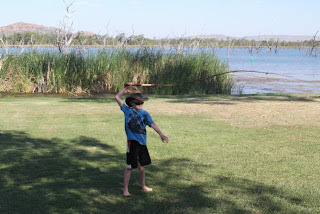 Our caravan tyre was not available still, so we decided to head out to Lake Argyle (and then double up on the 35Km drive back to Kununurra when the caravan tyre was ready) so we packed up in Kununurra and drove out to the Lake Argyle Caravan Park. Once we were all setup in the park we drove up to the water tank lookout to have a look over Lake Argyle and the Dam Wall. We also went for a swim in the lovely infinity pool that was in the park (which has a magnificent view over lake Argyle). The water was really cold, but it didn’t stop any of us going in for a dip on a pretty warm day. That afternoon we watched the sunset on the cliffs around Lake Argyle. The next day we got moving pretty early to start school (after brekkie etc). We finished school for Josh and Natalie by 9:30am. 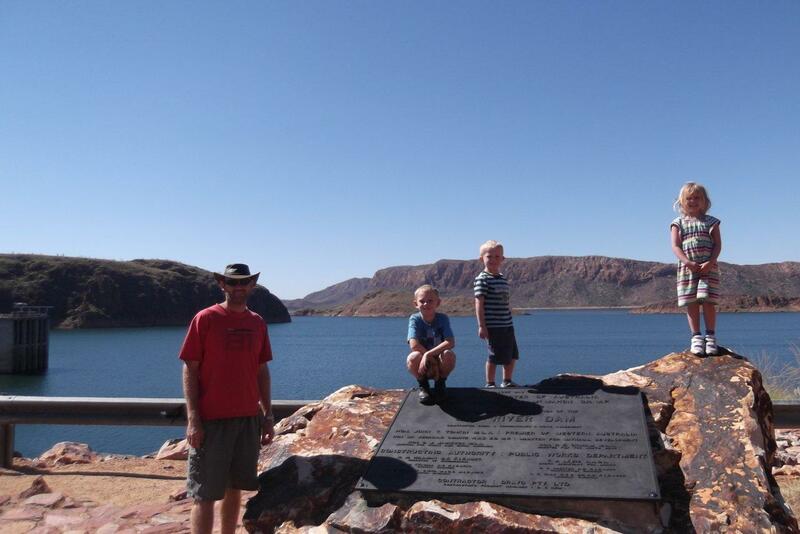 After school we drove down across the Lake Argyle Dam Wall and down to the bottom of the other side to the Ord River. 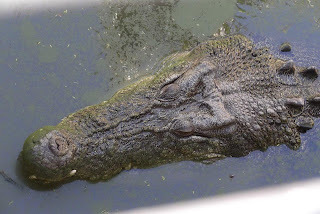 We saw a large crocodile (presumably a freshwater) swimming around the bottom of the dam wall. 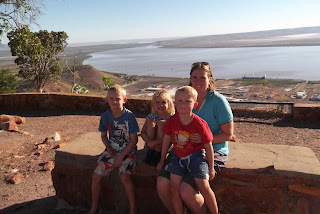 We drove to a lookout nearby to view the dam wall from a different perspective. 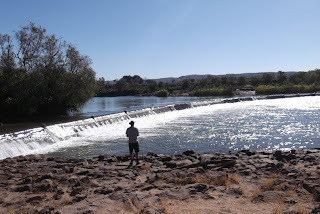 It is a very amazing structure and we were amazed that they were able to create such a small dam wall but allow such a huge amount of water to be stored (over 21 times the size of Sydney Harbour). 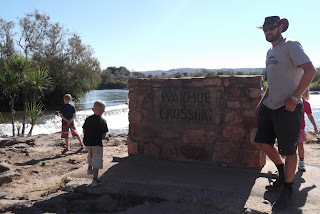 During that day we also went and had a look at Dead Horse Springs and the spillway bridge (neither of which were really impressive, but we wanted to have a look around the area). After lunch we went to the homestead museum to have a look. 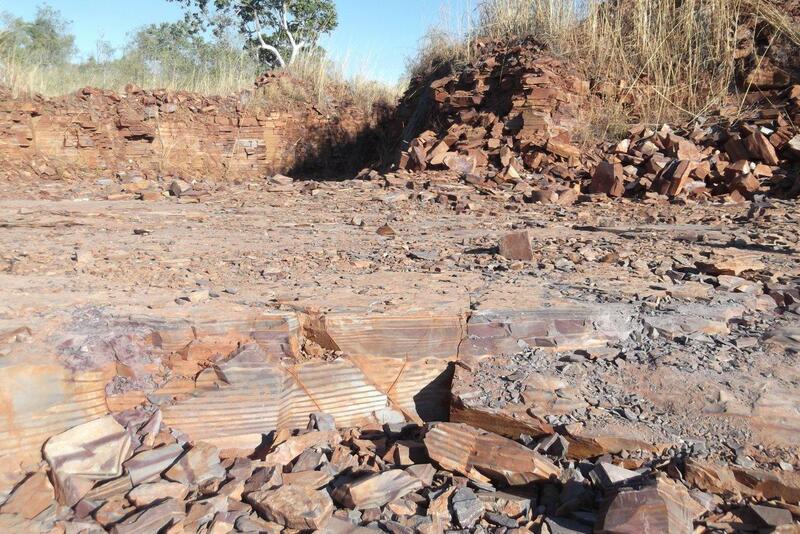 The original Durak Homestead site is now at the bottom of Lake Argyle and they relocated the homestead (stone by stone) to its present location. 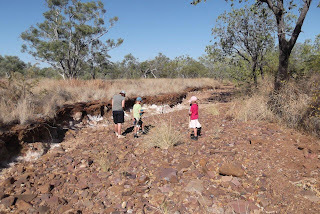 It was interesting to have a look around for a few minutes before the kids got a little bored, so we went back to the caravan park for another swim in their ‘infinity pool’. It’s such a nice pool, but was still very cold (I guess it is coming to the middle of winter! so it’s nice to be swimming at all!). 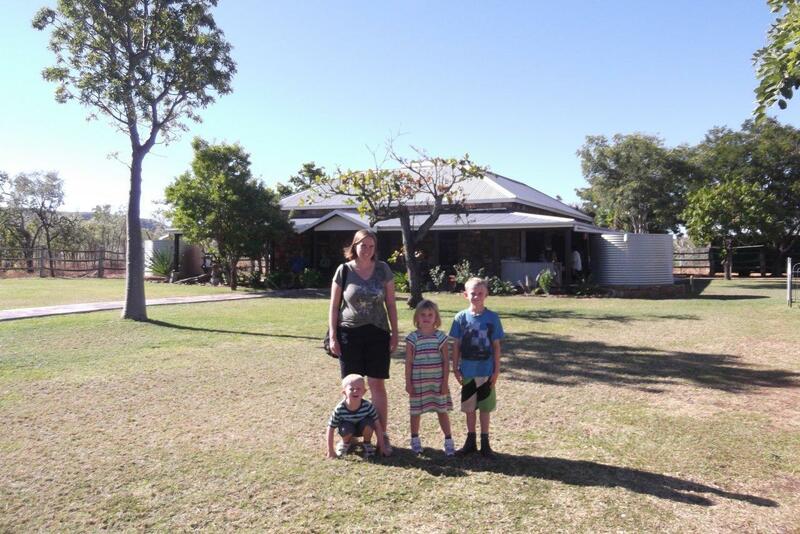 We spent the rest of the afternoon around the caravan park. 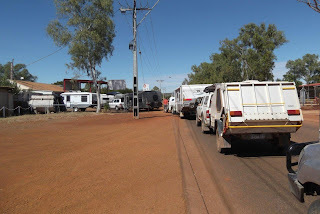 The Caravan tyre was ready by Thursday the 21st June, so that morning we packed up and drove to Kununurra to pickup the tyre (and some more food). We left Kununurra and drove east. 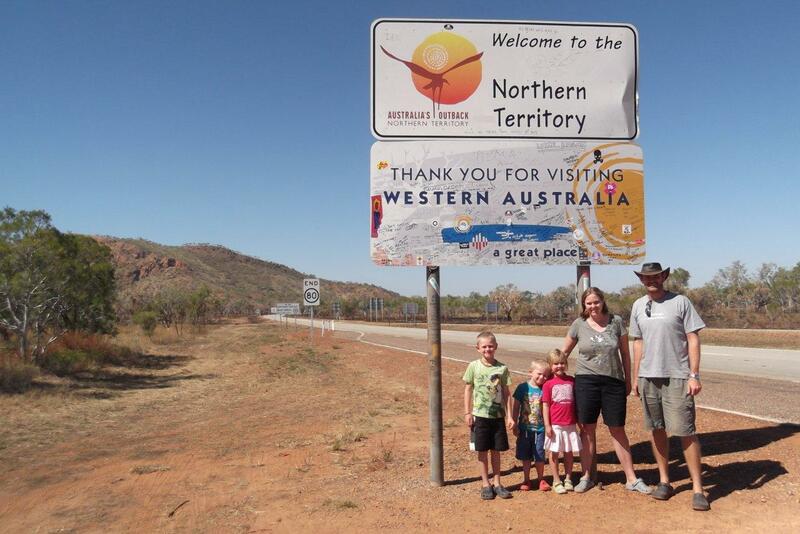 After spending five months in Western Australia we crossed the border into the Northern Territory. 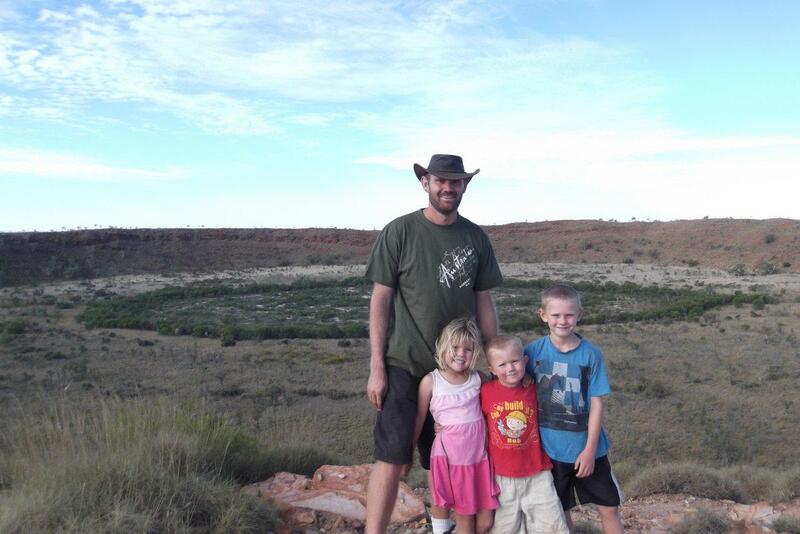 Leaving Western Australia after spending 5 fantastic months in this great state. Not far past the border we stopped at the Zebra Rock Mine and campsite to stay for the night. After we had setup we did some fossicking in the creek and found our own Zebra Rock! We bought some sandpaper from the campsite shop and sanded our Zebra rock for a little while. 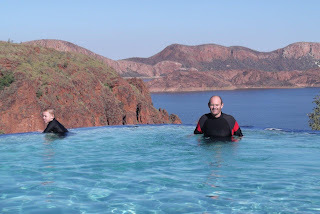 We drove to a Lookout just up the road which gave a great view over the area and some glimpses of Lake Argyle. That night we enjoyed a campfire, and we made some damper for dessert. The next morning we went on a Mine Tour at 9am (which was 7:30am according to our body clocks!). We took a short bus ride to the mine and then the tour guide spoke about the formation of the rock and how they mine it. It was quite interesting (and free too - which was a bonus!). After the tour we did school before packing up and driving off. We stopped in Timber Creek to get some Diesel and spotted our friends, the Guse Family, having lunch in the park. 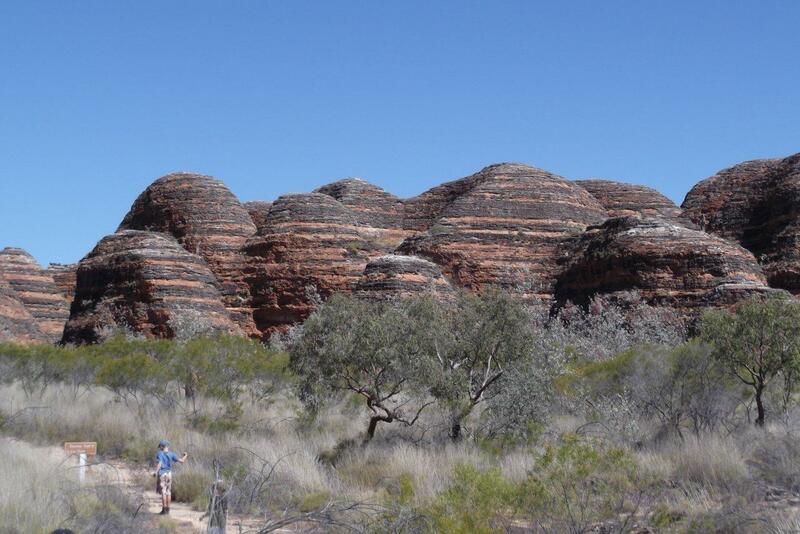 After a brief chat we discovered we were heading to the same campsite that night, Sullivan’s Campground in the Gregory National Park. We had dinner with them and sat around a communal fire for a while with some other campers. 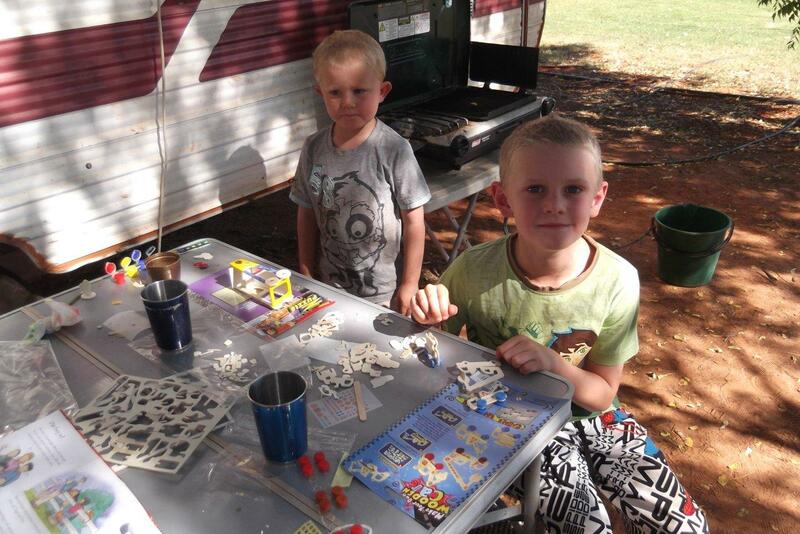 On Saturday 23rd we drove into Katherine and setup at the van park. Our caravan fridge had finally given up working on gas (the thermocouple had died) so once we were in Katherine Mike rang around and found a gas plumber who was able to sell him the spare part (On a Saturday too – not bad for a country town!). 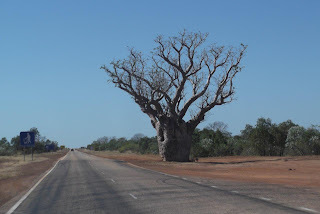 So within a few hours we had our fridge working on gas again which Mike was very relieved about – considering we were planning to head into Kakadu for 10 days after leaving Katherine. That afternoon we went to the information centre and then did our food shopping to get ready to ‘head bush’ for a while in Kakadu National Park. In Kununurra we stayed at the Kimberlyland Caravan park, our friends Catherine and Dean Guse were staying there and it was the first caravan park we have come across that has a family camping rate (and a cheap one at that, only $39 for a powered site!). 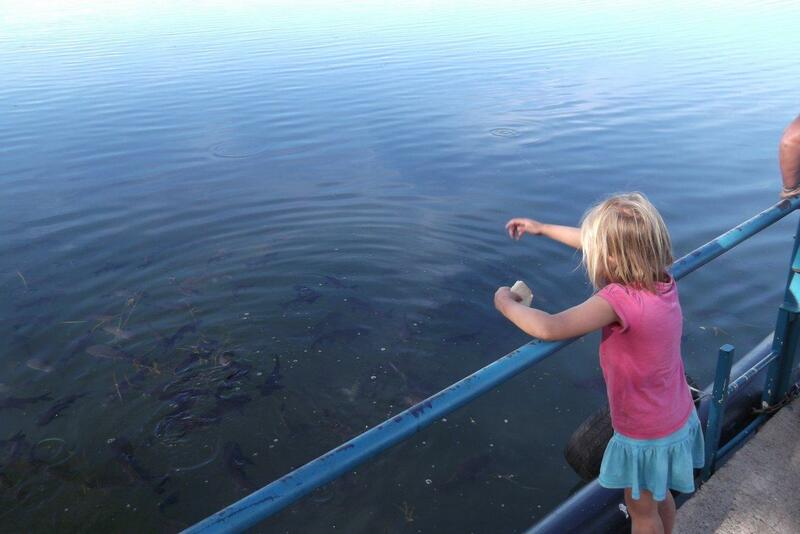 The van park was fully booked, so we got to go to the ‘overflow’ area (an unpowered area right on the lake). We setup the van and then headed into town. 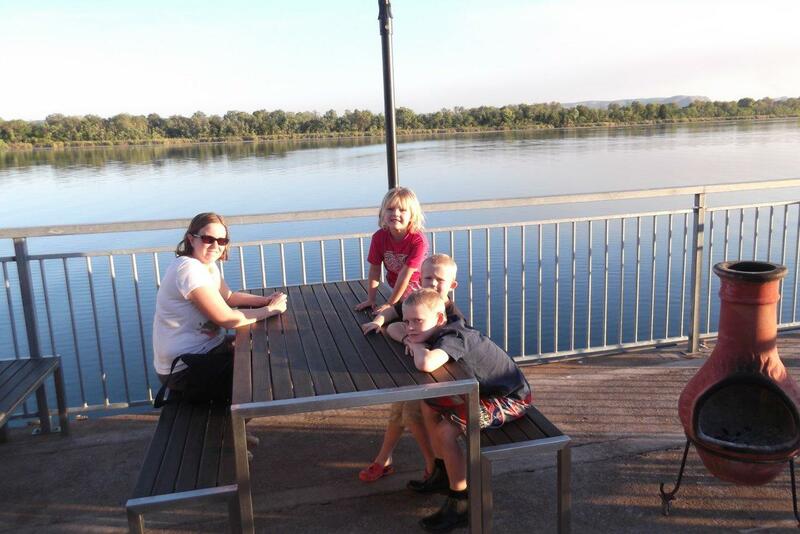 Kununurra was the largest ‘town’ we’d been to in a while, so we went to the shops and stocked up all our supplies. After shopping, we had dinner with the Guse’s and swapped stories about the last few weeks since we’d seen them last. 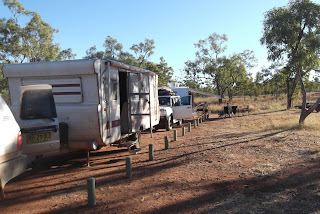 The next day we headed out again to do some shopping, but this time for a few clothing items, we also needed to look into getting one of our caravan tyres replaced as it had a bubble forming and we wanted to get it fixed before it blew out. While we were in town we stopped in at the Kimberley Fine Diamonds shop just to have a look at the pink diamonds (Liz wasn’t too disappointed when we didn’t buy any J). 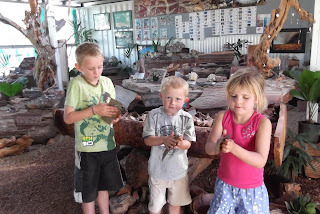 Once we had finished in town we headed out to the Zebra Rock gallery and while we were there the kids feed some bread to the huge cat fish which live in the river. That night we had been invited to have dinner with Gary and Nikki Alexander (the local Anglican minister) and some other church members as well as Greg and Jocelyn (another BCA nomad couple who had been working with Gary and Nikki for about 3 weeks). We had a lovely BBQ dinner, and the kids had a great time playing with some other kids from the church. Thursday the 14th June we headed to Gary and Nikki’s house early to do a bit of work. 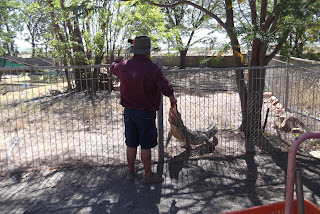 Mike helped Greg (one of the other BCA nomads) with some gardening and Liz helped a little bit with Gary, Nikki and Jocelyn labelling jar of Mango Jam and Mango chutney that Gary and Nikki sell at the local markets. We worked from 9am to lunchtime and in the afternoon we headed out to have a look at Ivanhoe Crossing. Mike chucked a line in - but no fish, we did spot a croc in the water. We also went to the sandlewood factory. 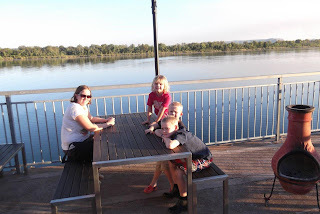 Later that afternoon we went to the Pump house restaurant for a milkshake and to watch the sun set over the Lake, we watched a sea plane land while we were there and we saw hundreds of catfish swimming around - hopeful for a feed, we were hoping to spot a croc - but we didn’t. 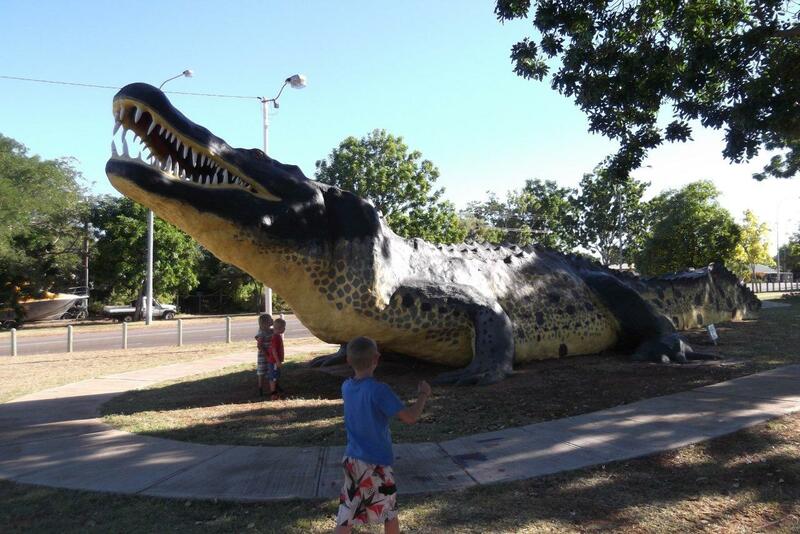 That night we went Crocodile spotting at the lake next to the caravan park. 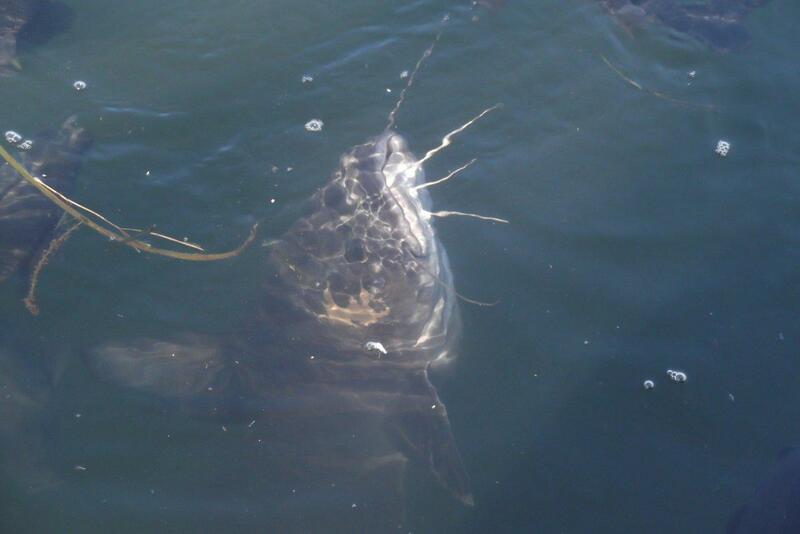 With our torches you could clearly spot their bright orange eyes shining back at you. 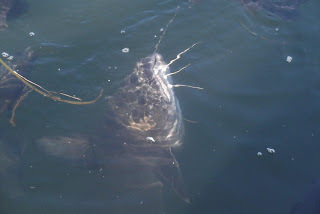 There were a lot out there and we believe they were all freshwater, but you never can be too sure. 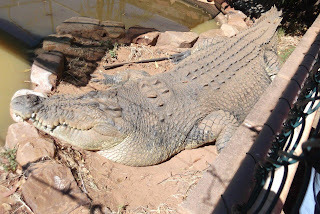 Friday was Gary’s day off, so we left Gary and Nikki in peace (Greg and Jocelyn headed to El Questro for the day) and so we had a lazy morning around the caravan. 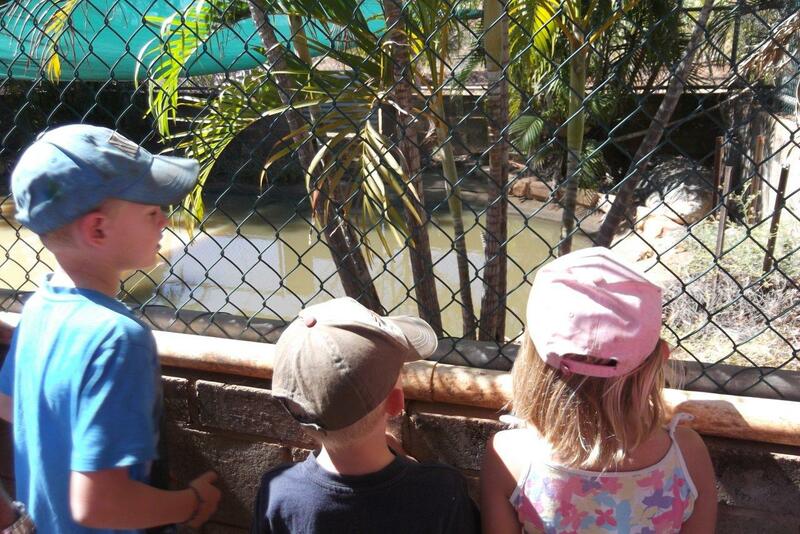 We could pick up “ABC 2” on the TV, so the kids got to watch some TV in the morning (a novelty for them). We did loads of washing and then went for a quick look around town. The kids also had a play at ‘Celebrity tree park’ but it was pretty hot (35 degrees) so we went back to the caravan park for a swim after lunch. That afternoon we drove out to Mirima National Park (sometimes called the Mini Bungle-Bungles (but we didn’t think they looked anything like the bungle bungles). After that, we drove out to ‘swim beach’ just to have a look. 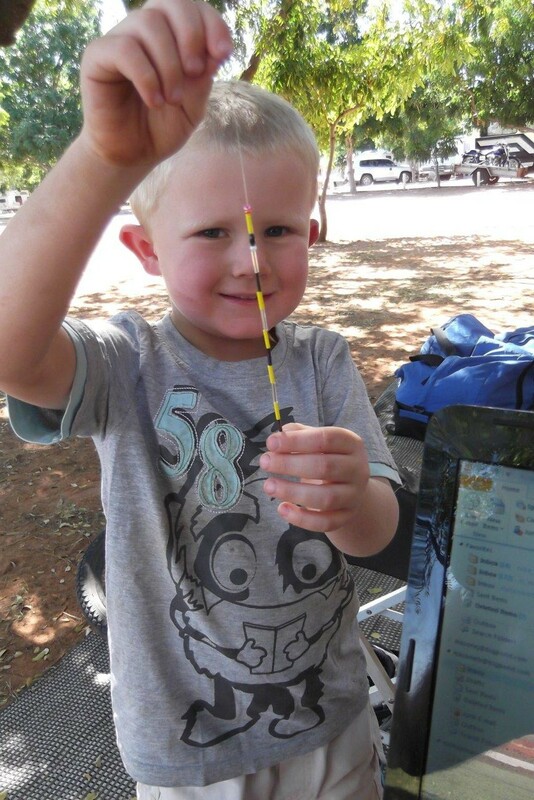 We went to the markets on Saturday Morning (they are on every Saturday during the ‘tourist season’ (dry season) in Kununurra. We had a browse around and bought some bits and pieces. Mike was keeping his eye out for a stockwhip to buy on the trip and met a man who made them (and was selling them at the markets) and so Mike had a good chat with him and ended up buying a one later that morning. 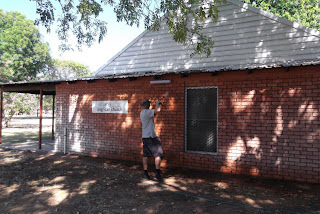 After the markets, we dropped Mike to Gary and Nikki’s house to start doing some work with Greg, they built a garden shed that had been bought some time ago but never put up. This took about 5 hours to fully construct. Mike finished the work about 3pm. 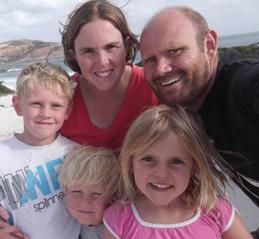 In the meantime, Liz and the kids had been having a quiet day around the van. When Mike got back, we all had a swim in the pool to cool off. That night we all went Crocodile spotting again. 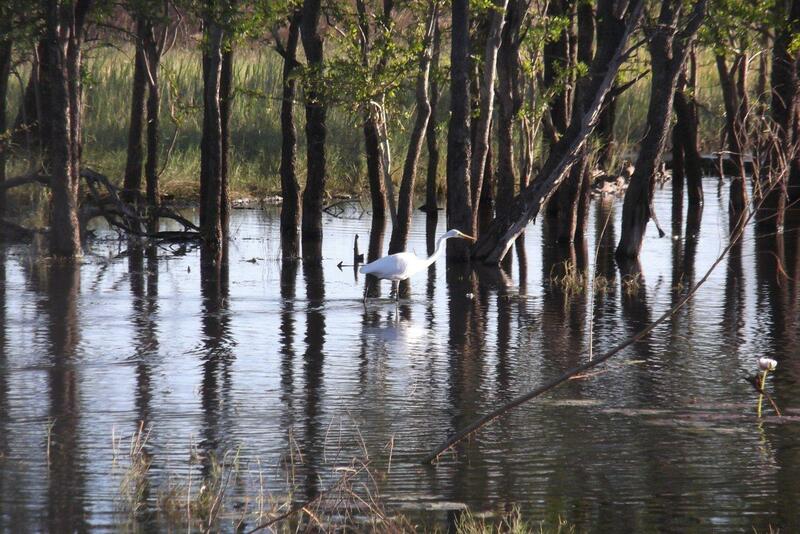 We went to church on Sunday morning at St James, Kununurra. There were lots of people there and we had a great time meeting people at the church and joining in the fellowship there. After church we headed back to the van for lunch before heading to Coles to do a big shop to re-stock our very small pantry! It was very hot (it had been hot for a couple of days) and it was still 35 degrees at 3pm, so we went for a swim in the pool at the caravan park. The rest of the afternoon was spent with the kids playing around the van and meeting more new friends from the park. Mike had to take part of the caravan fridge apart which seemed to had broken (the burner wouldn’t stay lit) and after a clean of the parts he re-assembled it and it seemed to work OK again (for now!). The next morning (Monday) we were due to pickup a new caravan tyre from the local tyre shop, but the truck that was bringing it up to Kununurra (from Perth) broke down in Port Hedland, so the tyre wasn’t available when we went to pick it up. Mike made the most of being there and got a wheel balance done on the car. Monday was a pretty lazy day for us; after we’d finished school, we just hung around the caravan park. 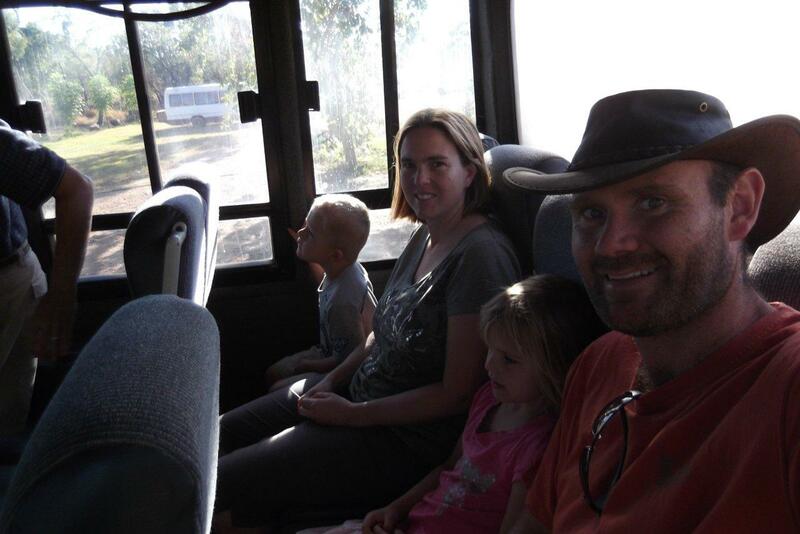 That afternoon the Guse family returned from their camping trip to El Questro, so the kids played together and we caught up over dinner. 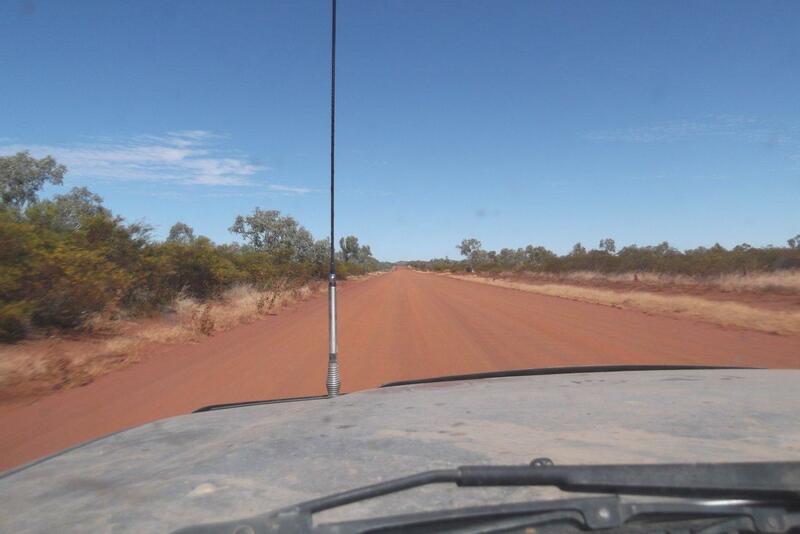 We left Derby on Sunday 10th June by 9:30am, knowing that we had a long day of driving ahead of us. We had planned to stop at Mary’s Pool Rest Area that night (a popular spot with the grey Nomads), but we got there at 3:15pm and didn’t want to setup that early so we just had a quick look at the campsite (and there were about 100 caravans there, it was sooo busy) and then we kept driving toward Wyndham. 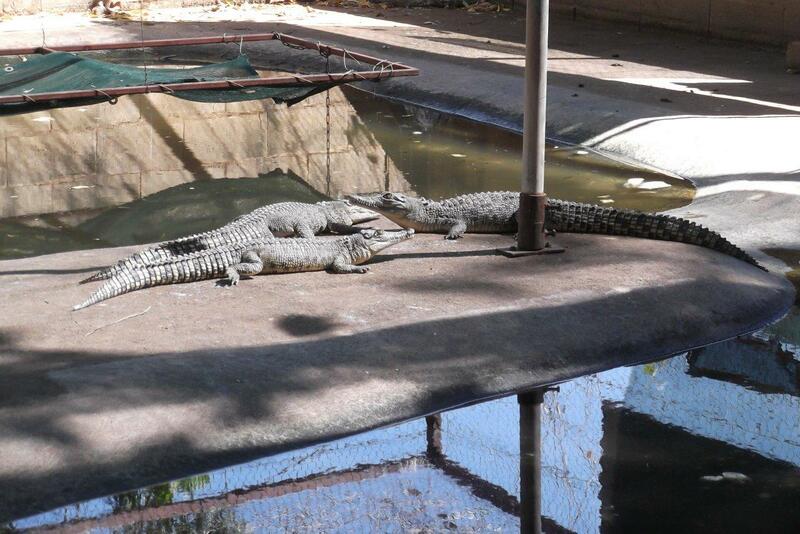 Mary's Pool Rest area - you would think it's a caravan park!! We decided to head to the next 24 hour stopping spot (Leysters Rest) which was another 2 hours further down the road. 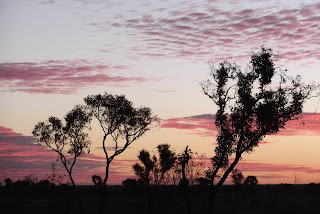 We drove for another couple of hours and then pulled into Leyster’s Rest area after sunset. 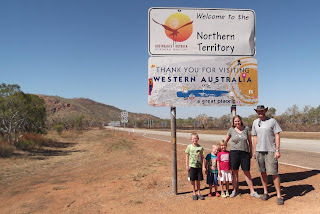 We had driven 630Km’s that day (and when you’re towing a 2t van with a non-turbo 4WD going 90Kmph as a top speed, then 630Km’s is a pretty big day!. We drove into the dark which was the latest driving we’ve done on our trip so far, but for a roadside stop that’s exactly how we wanted to do it. The drive from Derby to that rest area wasn’t anything particularly spectacular – there were lots of boabs, a lot of spot fires (which are apparently very common up North in the start of the dry season), lots of ‘Savannah’ type vegetation with the spinifex grass growing tall amongst sparsely spread out trees and lots of road trains. 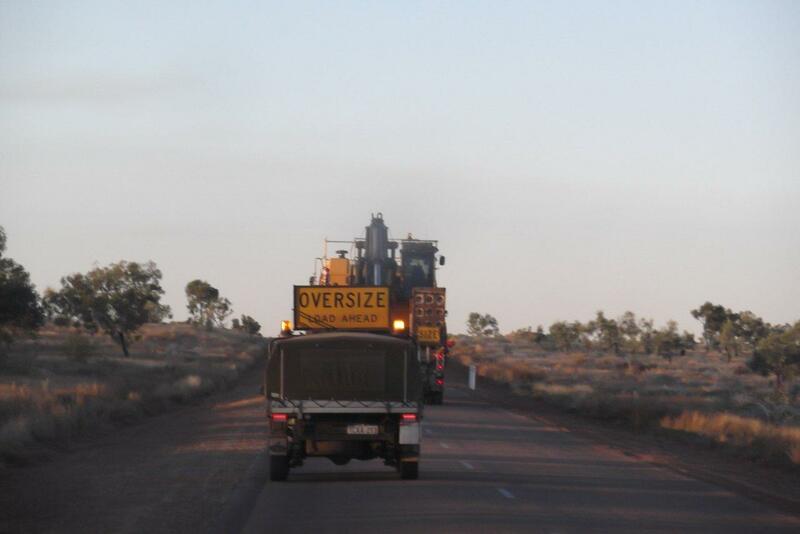 After we’d left Mary’s Pool, we came up behind a very large ‘Oversize’ truck that was taking up the entire road (both ways). They called us on the Radio and asked if we wanted to overtake, but as they were pulling off at the next rest stop, we let them go in front of us for 10Km. ﻿﻿We slept quite well at that rest stop, with only the occasional Road train rumbling past on the main road a hundred metres away. 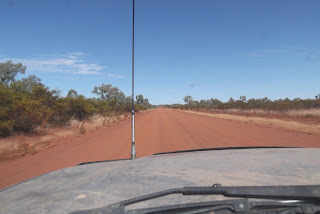 We had left the car hooked up to the van that night, so after breakfast on Monday we got back into the car and drove to Wyndham. 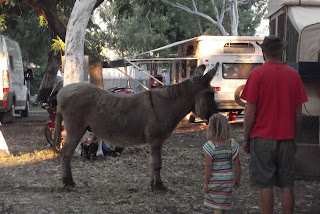 We setup our van in the Wyndham Caravan Park (which has a resident donkey lurking around the park, which the kids loved to look at, but it was pretty big, so we didn’t let the kids too near him!). Wyndham Caravan Park's resident Donkey! 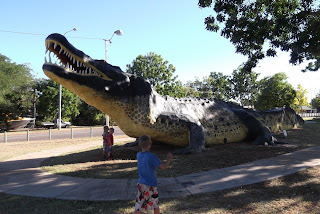 When we were all settled, we went to have a look at some of the main attractions of Wyndham: the Wyndham Jetty, the 5 rivers lookout, the big crocodile and the dreamtime statues. 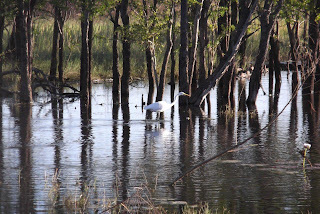 After we’d had a look at all of those, we decided to drive out toward Parrys’ lagoon (which is a large billabong with lots of birdlife) and went to the Bird Hide that they have setup there. 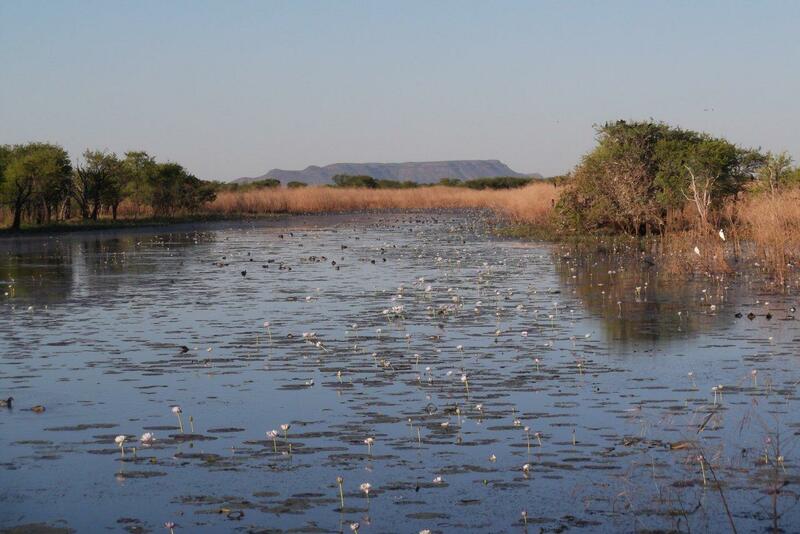 There were heaps of birds at the with lots of different species as well as lots of fish too, it really was teeming with life. A bit later on, we had a look at a 2000 year old Boab which is in the Wyndham Caravan park. 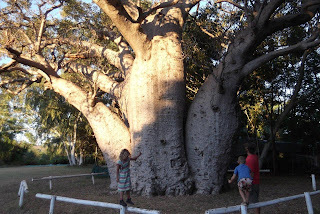 It was a massive tree! The next morning we left the van at the caravan park so that we could go to the Crocodile Farm just up the road. 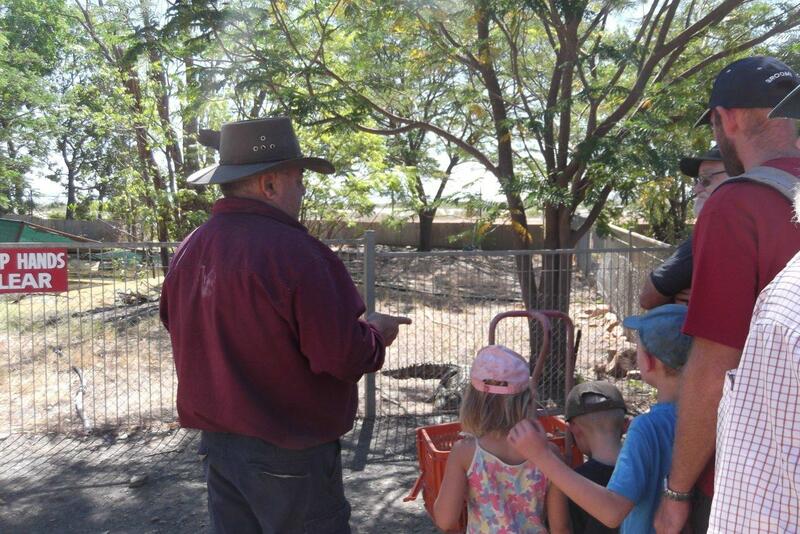 The farm runs a tour each day at 11am and so we joined the tour to feed the crocodiles and have a look at what was there. The farm breeds crocodiles for their skins (which get exported to Paris). 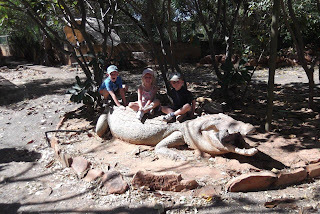 We really enjoyed the crocodile tour – it was definitely the highlight of our stay in Wyndham. 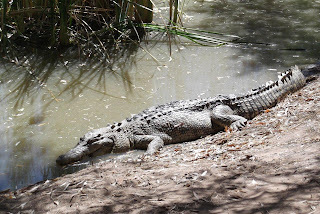 The bloke running the tour (the owner) was very interesting and informative, we ended up being there for 2 hours and seeing the biggest crocodiles we have ever seen in our lives! 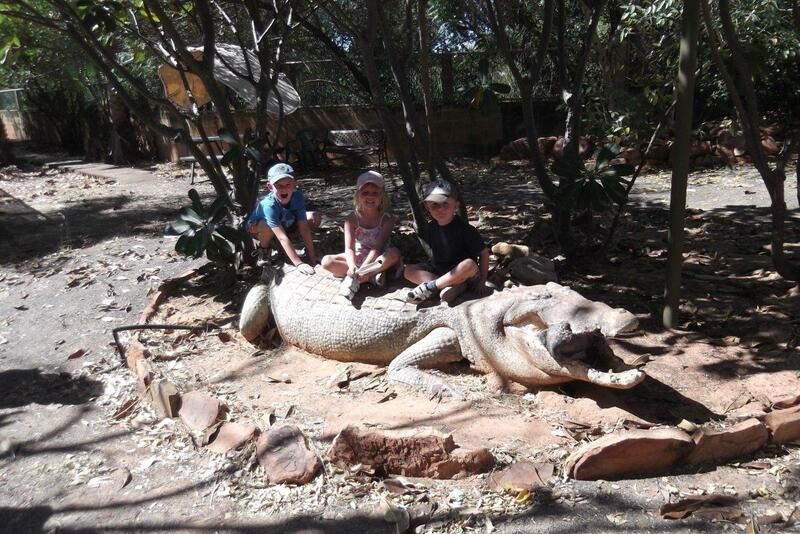 The biggest crocodile we have ever seen! 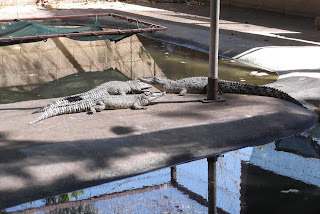 After the croc farm, we picked up the van and drove the 100Km from Wyndham to Kununurra. We had heard that the road into the Bungle Bungles was pretty rough, but after spending a week on the Gibb River Road, and doing some pretty serious 4WD tracks at El Questro, the drive into the Bungle Bungles was not too bad at all (and a bit of fun, with more water to splash through and some lovely scenery to view along the way). We stopped at the visitors centre, and then pulled into our campsite about 4pm. After we setup the tents we went for a brief walk around the campsite. 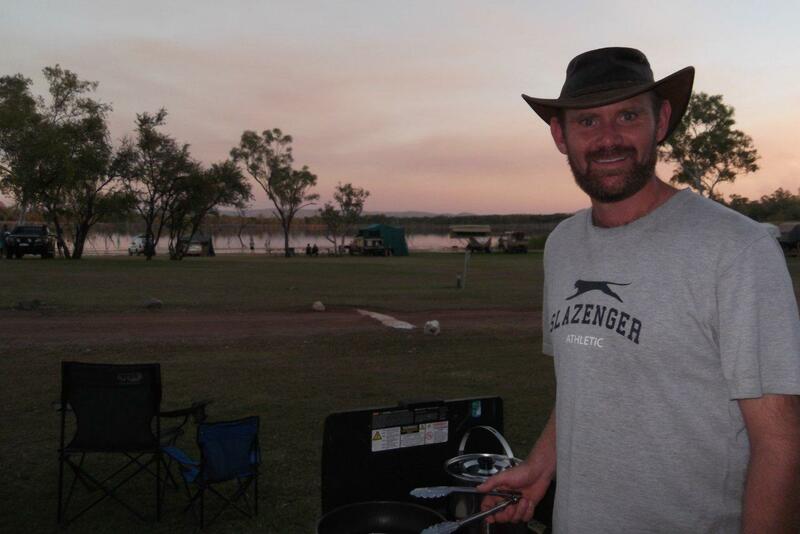 We had some dinner and then sat around the communal fire for a short while and chatted with some other campers. 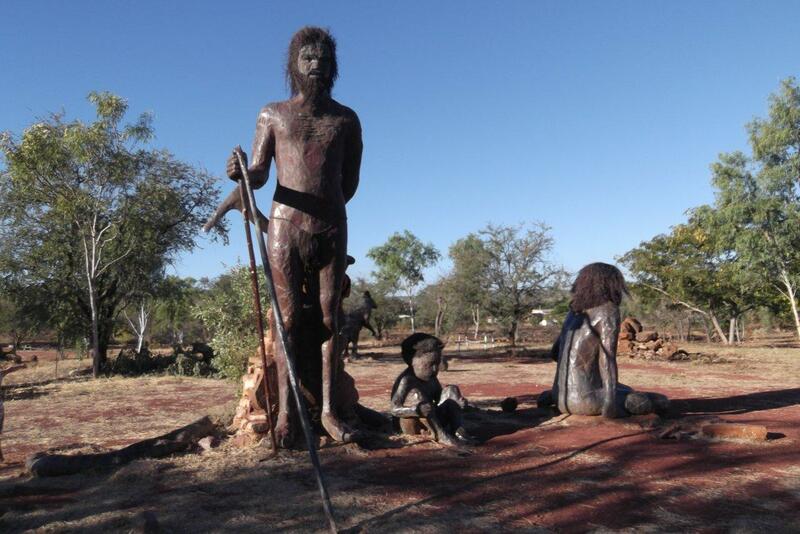 We went to sleep that night listening to dingos howling in the distance. After a chilly night (2.5 degrees apparently) we were up early for brekkie on Wednesday. We wanted to go to the Dome Walk early because we’d been told that it gets very hot during the middle of the day. So we were on the road, driving to Piccaninny creek by 8:30am. 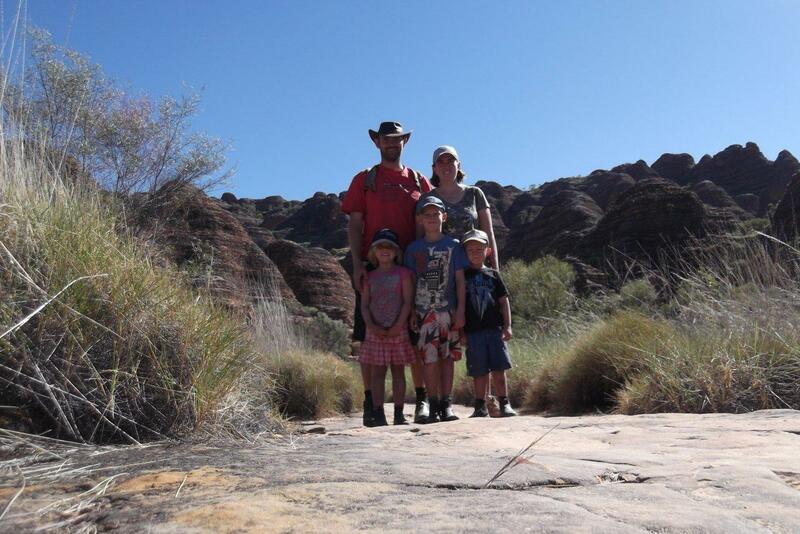 We walked along the Domes track and enjoyed being at the bottom of these amazing rock structures called the Bungle Bungles. It wasn’t too crowded when we were there as we managed to time our visit between 2 tour groups. 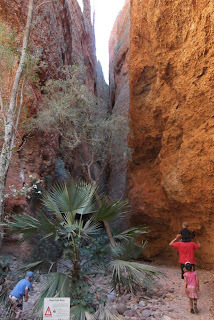 We then walked to Cathedral gorge which was fantastic. The acoustics in the gorge are brilliant and the kids had lots of fun creating echos and singing different songs. We had morning tea in the gorge and had it all to ourselves for a while before heading back to our campsite for some early lunch. After lunch we drove to the Northern End of the National Park and went to Echidna Chasm. This was truly breathtaking. It was like God has sliced the rock with a huge butter knife because you walk along the floor of a very narrow chasm, but when you look up you see the top of the cliffs 180 metres above you! It was quite amazing. On the way back to the tent, we drove into Mini-palms car park, but decided that we wouldn’t cope with a 5km walk after all the walking we’d done in the last week. The kids were all exhausted after a week of tenting, and doing many kilometres of gorge walks in beautiful places around the Kimberly. We went back to the tent for some downtime before heading up to watch the sunset over the ranges from the sunset lookout near our campsite – it was quite remarkable watching the colours change and fade on the Bungle Bungles as the sun sank below the horizon behind us. We sat around the communal campfire for a short time again that night before flaking into bed (very early) because we were all exhausted. 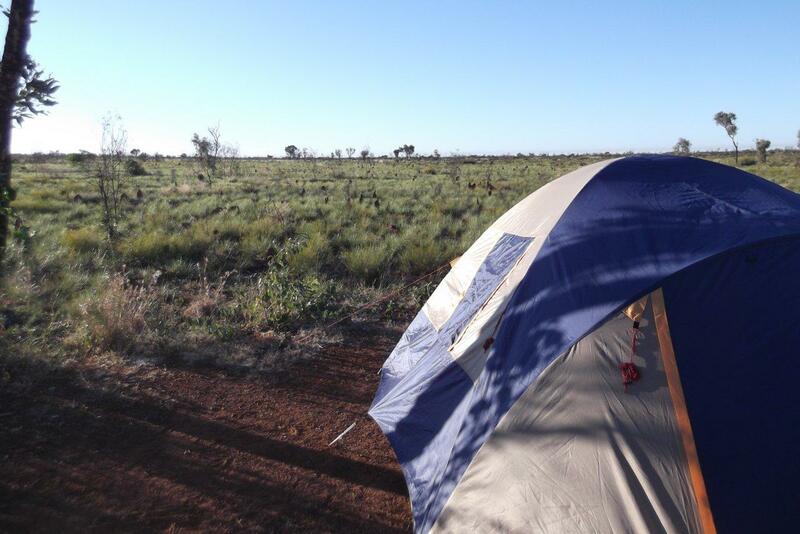 Camp life normally starts pretty early (especially when the sun is up at 5:30am, so we were up and got packed pretty early on Thursday because we wanted to try and make it to Derby from the Bungle Bungles National Park. 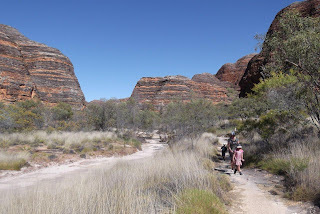 We drove out of the Bungle Bungle National park (its real name is Purnululu National Park) and we re-inflated our tyres and disengaged 4WD before we hit the Bitumen. We had a good run to Halls Creek and only had to overtake one four-carriage road train! 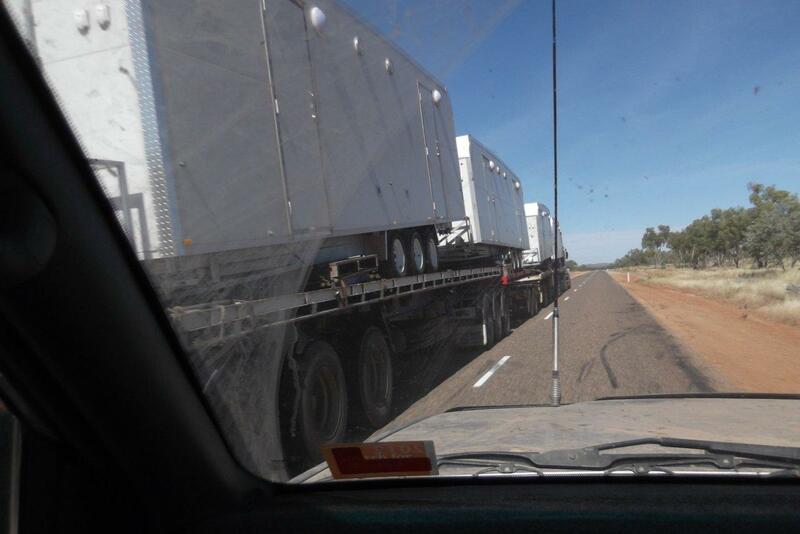 You certainly want a good stretch of road ahead to overtake these huge road trains! 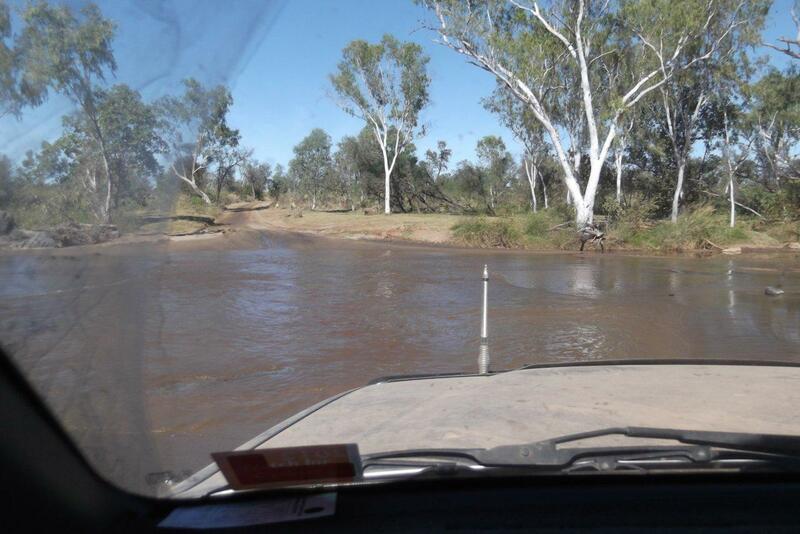 We filled up with Diesel and then thought we’d go to the visitor information centre. At the Visitor centre, we asked about the Wolfe Creek Meteor Crater. 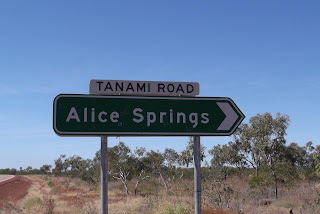 It was only 150Km down the Tanami Track, so we decided to totally change our plans and head out to the crater to have a look (as we wouldn’t be able to do it with the caravan in tow in a few days time when we passed back that way). 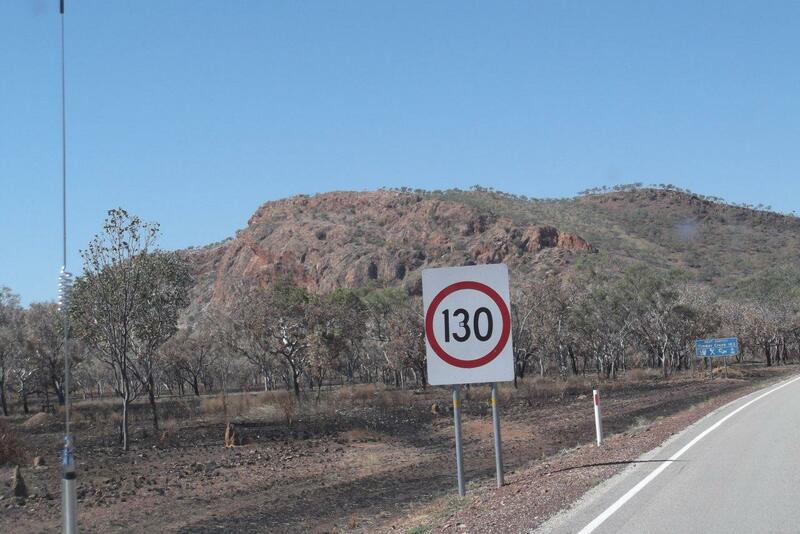 So we went to the IGA, re-stocked with some food and supplies and drove out to the Crater. 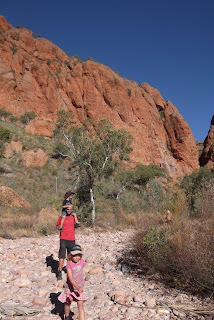 Once we got to Wolfe Creek, we walked to the top of the meteorite crater and then walked down the inside of the crater (which was really steep) and went right into the middle. By the time we were out of the crater, it was 3pm, so we decided to strike camp at the crater campground instead of trying to drive further on that day. 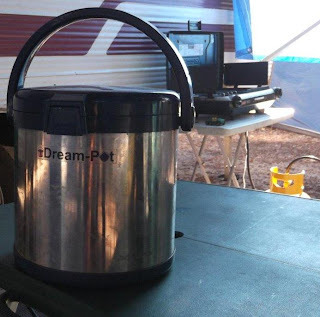 So we setup the tent and cooked dinner. 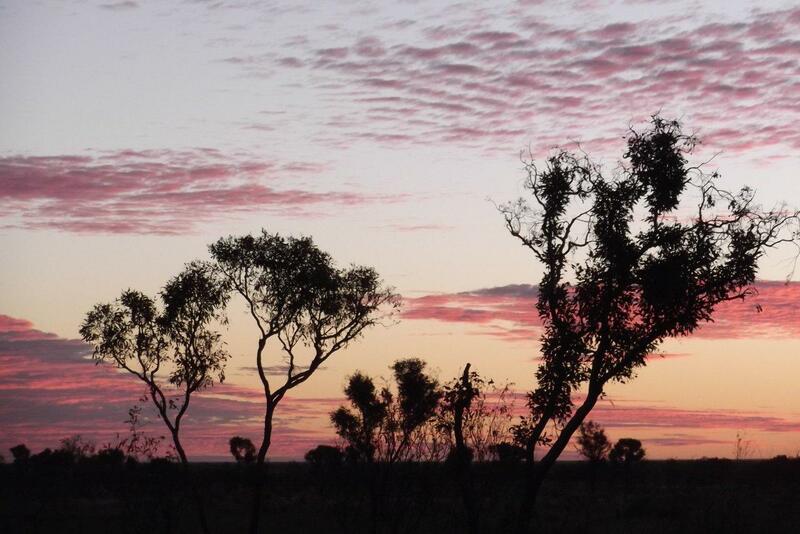 We were so glad we stayed out there because it was a beautiful campground with a lovely sunset and brilliant stars. The kids (and Mike and Liz) were all tired again – camping with the tents was fantastic, but it is much more exhausting than with the caravan; and living out of the back of the car is challenging at times, but we pretty much got it down to a fine art by the time we had finished at Wolfe Creek. We were going quite early again on Friday the 8th June because we knew that we had a pretty long day ahead of us to get to Derby (~650 Km) so we packed up the tent and left Wolfe Creek Crater National Park by about 8:30am. 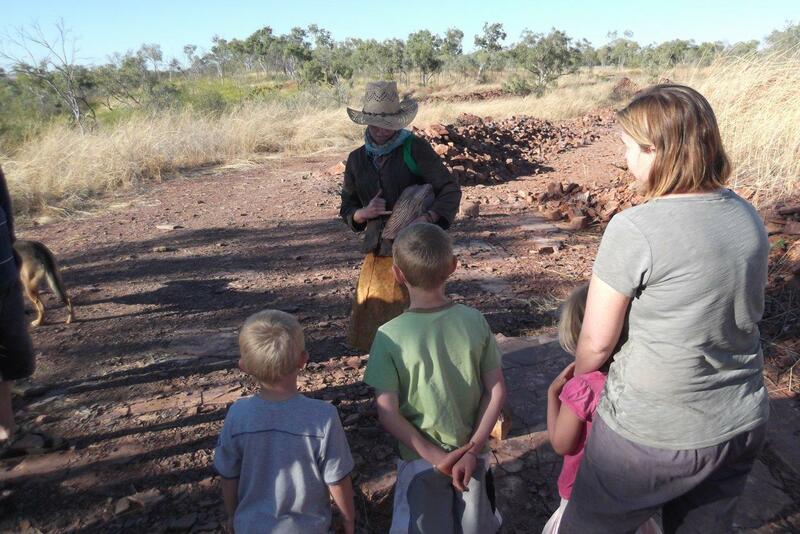 While we were packing up; Josh, Natalie and Sam had a quick play with 2 kids who were on a tagalong tour of the Canning Stock Route - it's great that the kids can make 'new friends' so many places as we tour around. We spent all of Friday in the car and arrived in Derby at about 4:30pm. We picked up the van from the storage facility at the start of the Gibb River Road and checked into a Caravan Park in Derby. Once we had dropped the van, we went food shopping because our supplies were fully depleted after 10 nights out on the road. 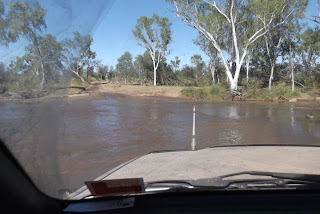 By the time we had finished our loop of the Gibb River road (and back to Derby via Wolfe Creek) we had covered over 2,300Km’s (in 10 nights!). 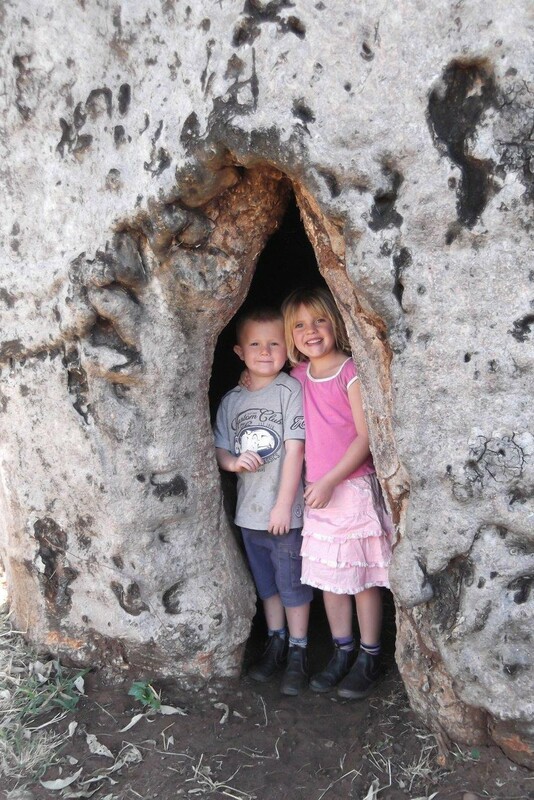 We would definitely recommend that anyone coming to this area of Australia does the Gibb River Road, the Bungle Bungles and Wolfe Creek Meteor Crater – they have so much to offer. We were very glad we didn’t take our van on the dirt roads because our old van would have shaken apart for sure (and it was quite nice having the freedom of just a car to be able to do detours (like the Wolfe Creek Crater). We had applied for leave from school so that we weren't trying to lug all our schooling gear with us in an already tightly packed car, so we all really enjoyed our “camping holiday” and really didn’t mind living in the tents for a week and a half; However it was nice to be back in our ‘own beds’ in the caravan that night in Derby. Early on Saturday the 9th June we decided that we didn't need to leave Derby that day, so we re-booked into the van park and spent the whole day re-sorting the van, unpacking the car and cleaning up all the camping gear. 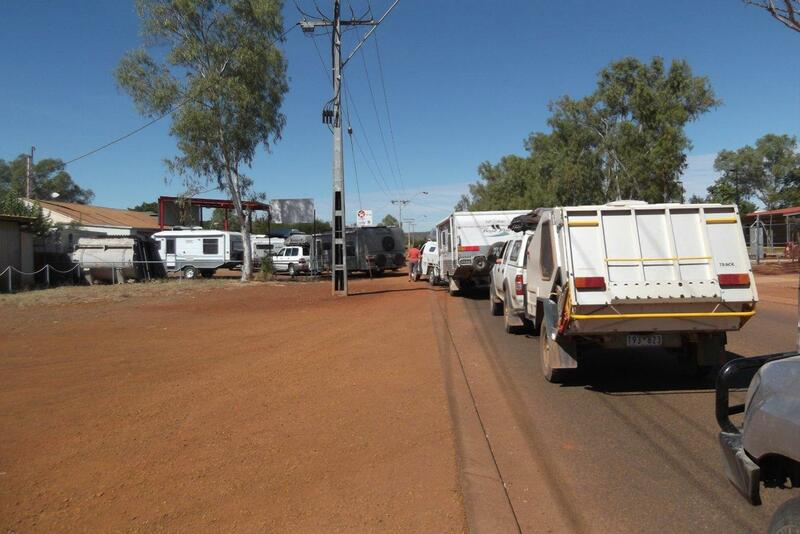 We all had a very low key day around the caravan park. We were all very tired and Josh, Natalie and Sam did some beading (which they'd wanted to do since we bought some beads in Broome) and just played around the caravan park (including riding bikes up and down the park). It was great to be able to re-organise the car and the van before we moved on because it would have been a bit difficult to get back into the 'normal' swing of things without fully re-organising the car and caravan.